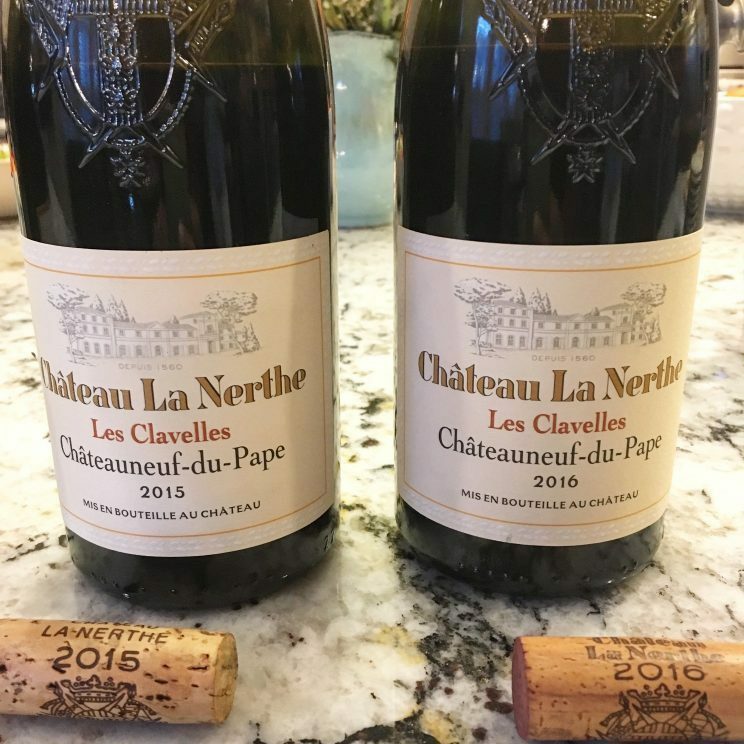 As one of the oldest1 estates in Châteauneuf-du-Pape, Château La Nerthe is THE quintessential expression of the region. The property stretches out over 200 acres with the vineyards planted in a single vineyard block around the château. And while all La Nerthe’s vineyards are certified organic by Ecocert, they have been making organic wines for over 20 years before it was even cool to make organic wine. At the end of the day, they make great wines that just happen to be organic. Within the vineyard block that surrounds the château are 57 designated single plots, each of which has its own individual terroir. About half of the vineyards are comprised of field blends (mixed grapes) which are all picked, crushed, fermented, and aged together. All told, the vines have an average age of 55 years. 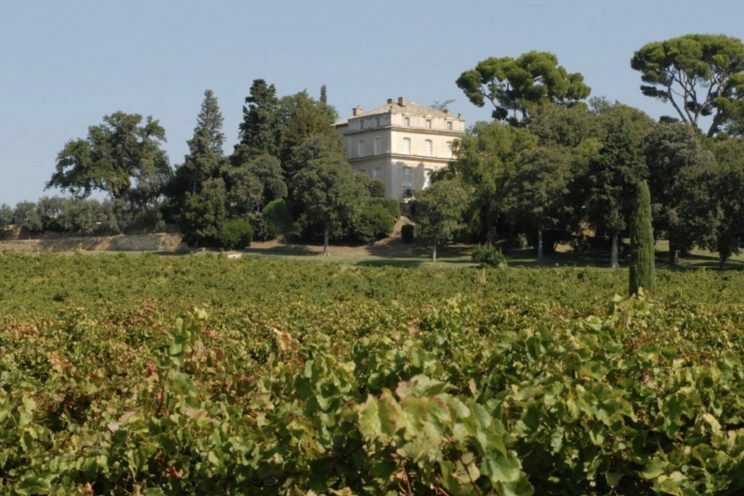 In addition to the vineyards that surround the château, La Nerthe also has two other vineyards nearby. 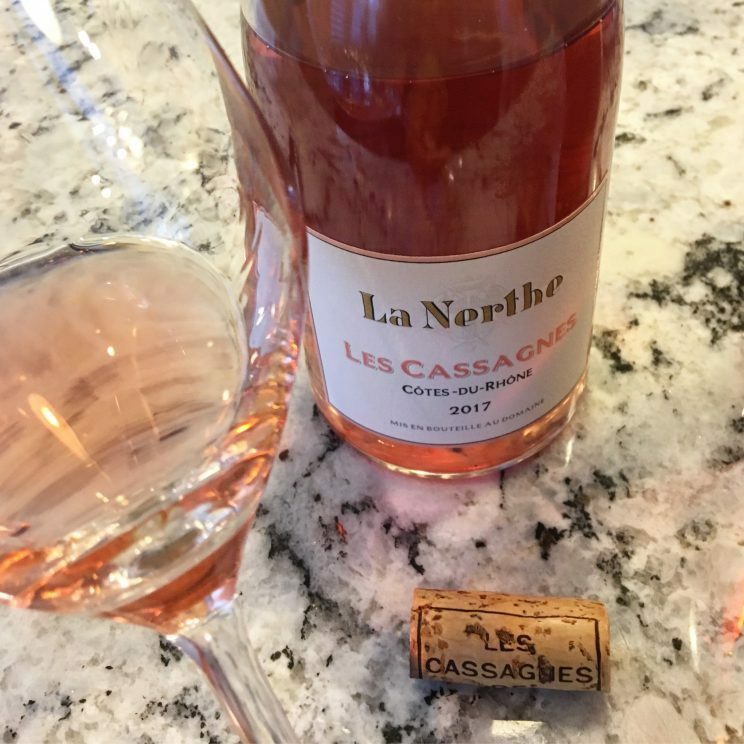 One of these is in Tavel which is the source for the fruit in their Rosés.2 The Tavel vineyards have quite a lengthy history and go back to the year 1199.3 Les Cassagnes4 de la Nerthe is the other vineyard of La Nerthe which is located about ten miles north of the chateau. Here’s a recap of the deliciousness. A blend of 40% Grenache, 30% Mourvedre, and 30% Cinsault, this is the first ever vintage for this wine. And while it was produced in Tavel, it doesn’t bear the Tavel appellation name as the color is too pale to meet the standard for a Tavel Rosé 6 It is produced using the direct press method, like those in Provence, with the grapes being pressed almost immediately after the grapes are received at the production facility. This limited skin contact results in a wine that is fresh, crisp, light-bodied and fruity – and perfect for a patio on a warm day. The second Rosé was a study in contrasts when compared to the first. In Tavel, winemakers are allowed to use eight different grape varieties7 and all eight are used in this blend. While still dominated by Grenache, the wine is also comprised of about 20% of white grapes. Even though white and red grapes are used, they aren’t made separately into wine and blended together at a later date. Instead all the grapes must be crushed and fermented together. 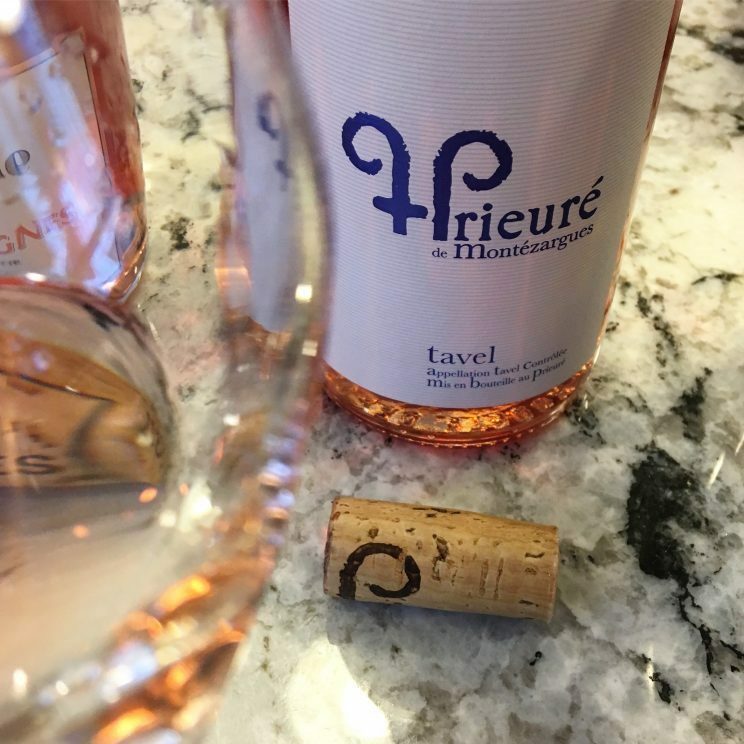 To meet the color intensity required by the Tavel appellation, this Rosé has longer skin contact. There is also more battonage (lees stirring) with this wine spending at least six weeks longer on the lees than the 1st Rosé. All of this results in a more full-bodied, complex wine that can be aged.8 Compared to the first wine, this one is “bigger” and definitely something to have with a great meal. 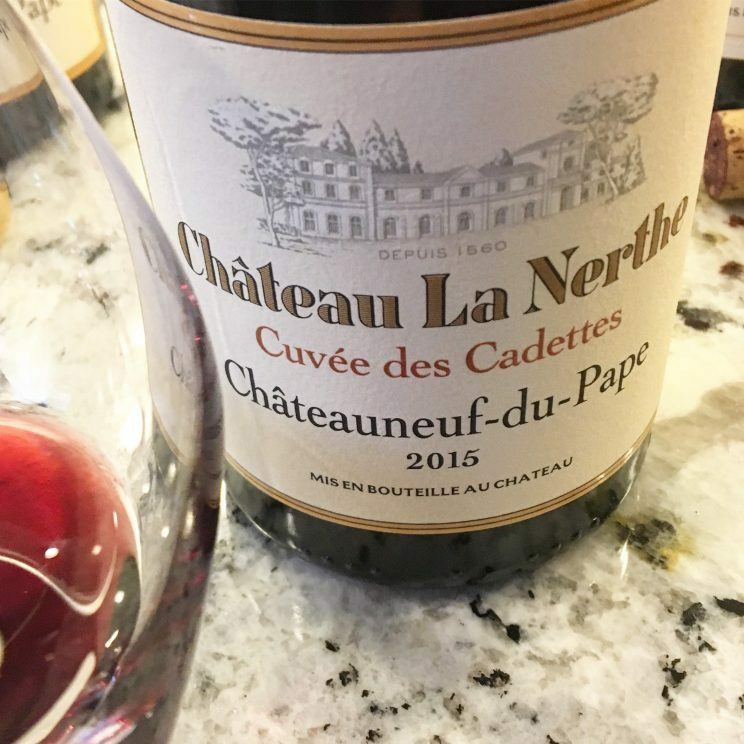 With only 5%9 of production in the region being white, this wine is definitely a rare gem from Châteauneuf-du-Pape. 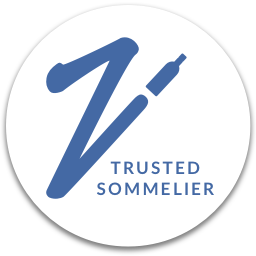 It is comprised of about 40% Roussanne which is fermented separately in oak barrels and the rest Clairette, Grenache Blanc, and Bourboulenc which are co-fermented in stainless steel. The 2 cuvees spend the winter on the lees and are later blended together the following Spring. So, a very short aging time spent on lees with battonage generally only performed until Christmas provides the ability to capture the freshness and aromatic expression of the wine, but also gives the wine some aging potential – the best of all worlds. 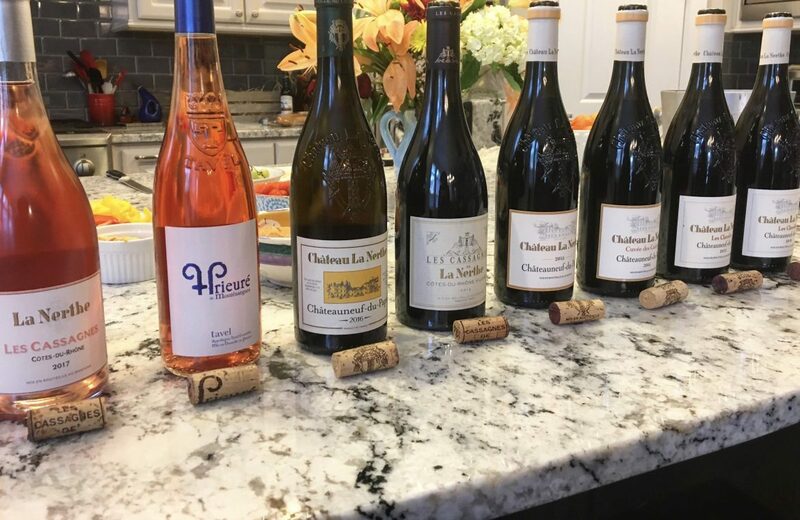 After this great introduction of Rosé and white wines, it was time for the reds, which is the backbone of the region and what La Nerthe of course is known for. 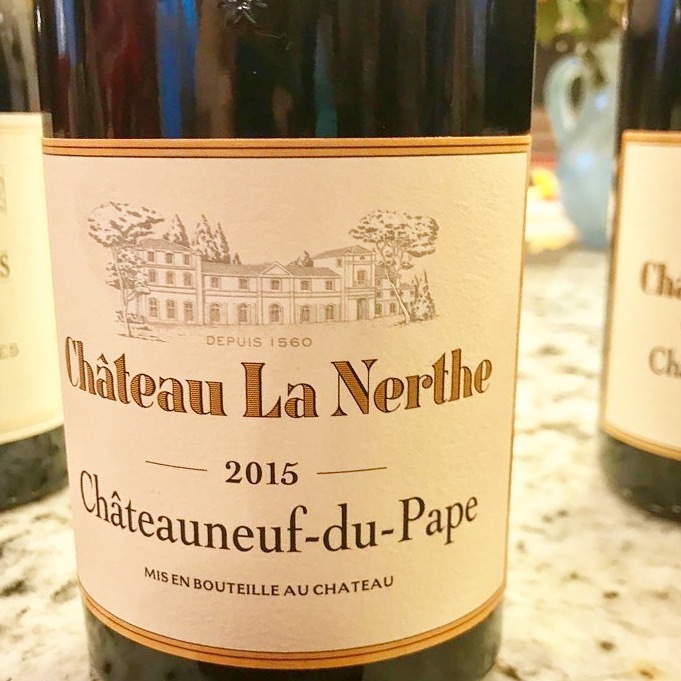 Of course, Châteauneuf-du-Pape is the heart and soul of what they do at La Nerthe and this one is a perfect introduction to their CDP and is the best representation of their wines. The wine is crafted using all 13 permitted grapes of the Châteauneuf-du-Pape appellation. Grenache comprises a little under 50% of the blend,11 with Syrah coming in at around one-third of the blend and Mourvèdre around 20%. 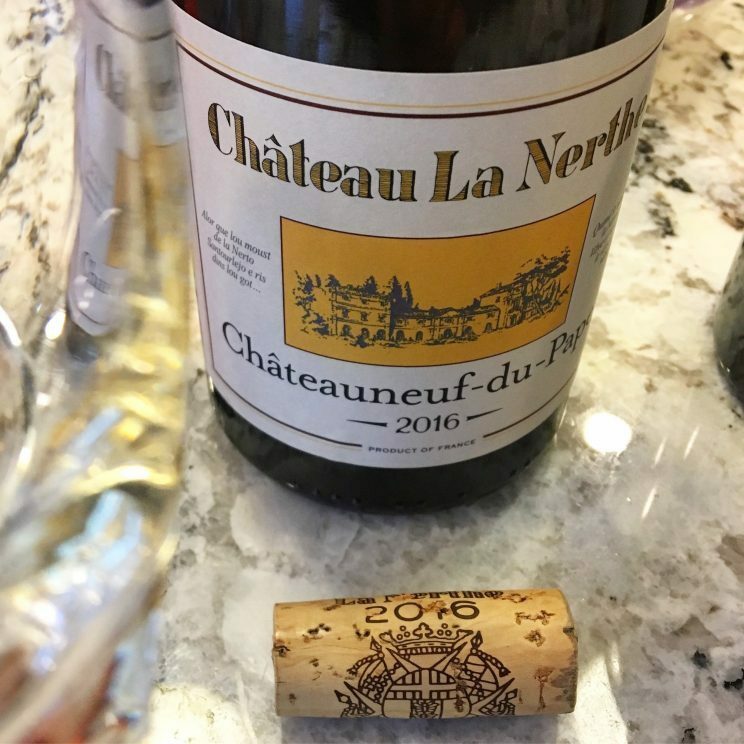 The use of higher amounts of Syrah and Mourvèdre is what really defines the wines of Château La Nerthe. I love the fruit and spice characteristics that the Syrah brings. So well done. This is a very special, rare wine that is not made every year. It comes from their oldest plot (called le Cadettes) and was the first one re-planted on American rootstock after the phylloxera epidemic. All of the fruit for this wine comes from very old vines with the oldest Grenache vines dating back to 1893. Talk about a piece of history! This particular vintage is comprised roughly of 1/3 each of Grenache, Syrah and Mourvèdre which are all co-fermented and then aged in 100% new oak. Just a delicious and quite a beautiful wine. I can certainly see why it’s so special and made in such small amounts. Christophe indicates that this is a wine for the next generation but I would have a difficult time exercising restraint. The last wines were definitely a fantastic way to end the night. Crafted of 100% Grenache using whole bunch fermentation, these wines were simply stunning. What began as an experiment for La Nerthe has turned into a stroke of genius. The wines come from one of their 57 individual plots called Les Clavelles which has soil comprised of a mixture of sand, red clay, and pebble stones. 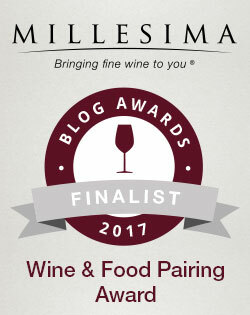 The wines have not yet been released 12 but I’m crossing my fingers I can find some when they are made available in the U.S. And while the vintages differed with 201513 being more approachable and 2016 a bit more structured and wound a bit more tightly, both of these will only get better with time. 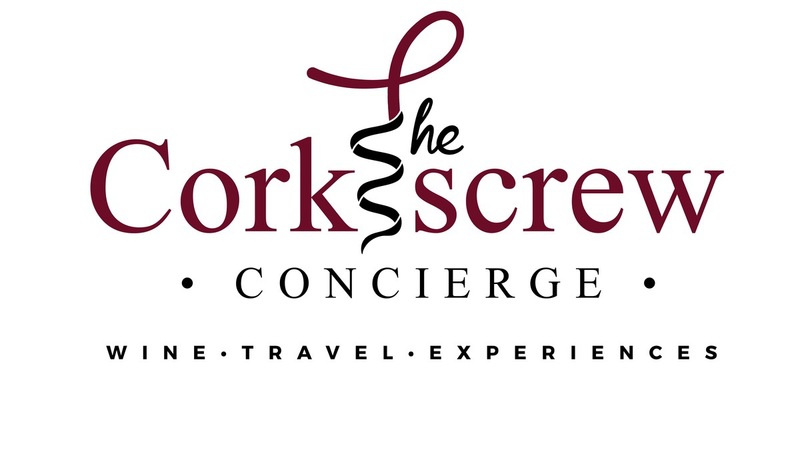 These wines just pulled you in with heady perfumed floral and fruit aromas as well elegant, finessed tannins. The only thing I can tell you is that if you come across any of these, grab them and hold on tight. You won’t be sorry! And don’t forget to invite me over! Evidence of shipments to Boston & Philadelphia dated in the year 1786 just after the Declaration of Independence was signed have been discovered. 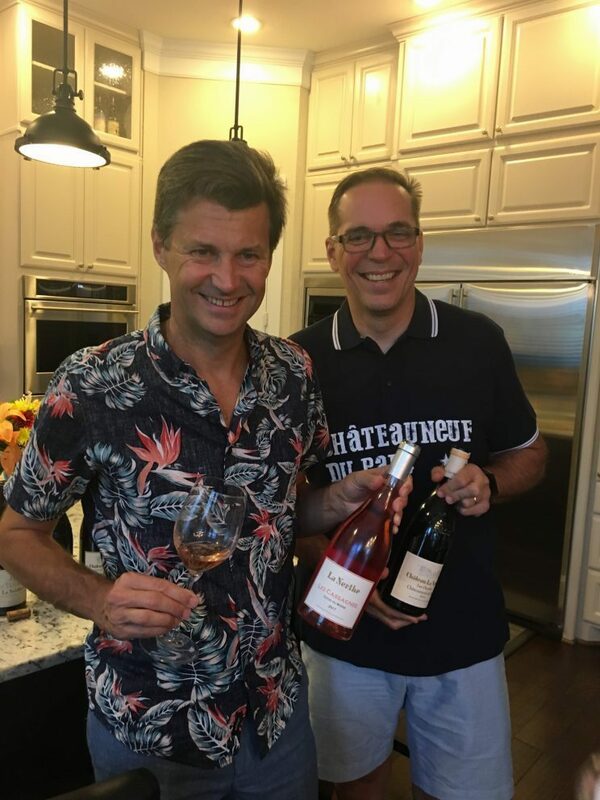 It is not permissible to make Rosé in Châteauneuf-du-Pape. Interestingly enough, Tavel is the only village operation in France that allows ONLY Rosé. This was the year in which the King of France granted the monks of Montézargues the right to settle and to make wines. Les Cassages is Provencal for “Oak Tree” and the vineyard was so named as it is surrounded on 3 sides by oak trees. You can follow Jeff’s tasty adventures, which may or may not involve a bike, here. Grenache, Syrah, Mourvèdre, Cinsault, Carignan, Clairette, Bourboulenc, and Picpoul. Yes you can age some Rosé wines. Don’t let anyone tell you different! La Nerthe actually has about 10% of its vineyards planted to white grapes. Cause I’m always on the hunt for a BBQ wine. Grenache comprises around 75% of the plantings in the Southern Rhone. However, La Nerthe’s plantings are a bit less than this which accounts for the lower amounts of Grenache and higher amounts of other grapes in their blends. Our group was actually the first people to taste these wines in the U.S. Expected release is in 2019. 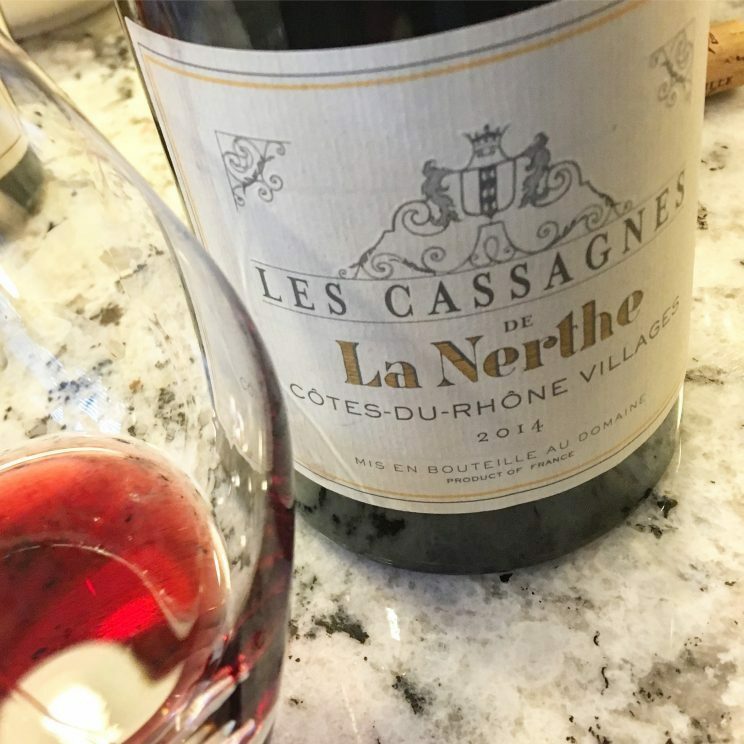 The 2015 wine was actually La Nerthe’s first wine to be vinified separately. Keep ‘me coming!